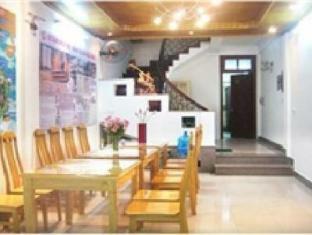 The Ngoc Mai Hotel is located in Hanoi making it one of the best hotels to stay at while in town. All 30 guestrooms at The Ngoc Mai Hotel provide all the comforts and conveniences guests would expect in a hotel in this class. All of the guestrooms are replete with in room safe, air conditioning, non smoking rooms. The amenities and services offered at this Hanoi accommodation include laundry service/dry cleaning, bar/pub, elevator. Being one of the good quality hotels in Hanoi, guests staying at this hotel will find its convenient location and tranquil atmosphere pleasurable. To make your reservation at the Ngoc Mai Hotel quick and easy, please select your preferred dates of stay and proceed with our secure online reservation form.